Like icons, windows are a ubiquitous part of using a Mac. The Finder appears in a window. When you open a folder, it’s a window that you see. When you write a letter, the document that you’re working on appears in a window, when you browse the Internet, Web pages appear in a window, and so on. For the most part, windows are windows. As you use different programs, you’ll probably notice that some of them (Adobe Photoshop or Microsoft Word, for example) take liberties with windows by adding features such as pop-up menus, or textual information such as zoom percentage or file size in the scroll bar area of a document window. Don’t let it bug you; that extra fluff is just window dressing (pun intended). Maintaining the window metaphor, many information windows display different kinds of information in different panes. And so, without further ado, the following list gives you a look at the main features of a typical Finder window (as shown in Figure 1). Window Title: Shows the name of the window. Scroll bars: Used for moving around a window pane. Sidebar: Where frequently used items live. Toolbar: Buttons for frequently used commands and actions live here. Forward and Back buttons: Take you to the next or previous folder. If you’re familiar with Web browsers, the Forward and Back buttons in the Finder work exactly the same way. The first time that you open a window, neither button is active. But as you navigate from folder to folder, they remember your path so that you can quickly traverse the path of folders. Another great thing about them is that you can navigate this way from the keyboard by using the shortcuts Command+[ for Back and Command+] for Forward. View buttons: Choose from three exciting views of your window: icon, list, or column. Action button: This button is really a popup menu of commands you can apply to the currently selected items in the Finder window. Close, Minimize, and Expand (gumdrop) buttons: Shut ’em, shrink ’em, and make ’em grow. Search field: Find items in items selected in this window whose names contain the character string you type in this box. Hide/Show toolbar button: Causes your computer to melt into a puddle of molten silicon slag. Just kidding! This button actually does what its name implies — hides or shows the toolbar of a window. 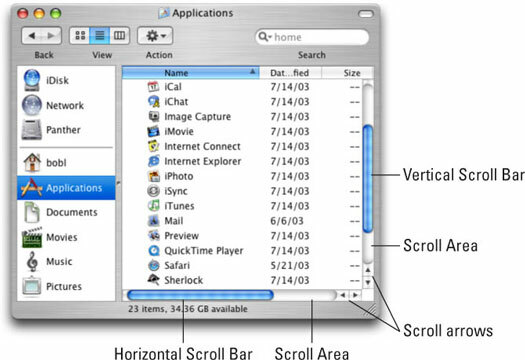 Figure 1: A typical Finder window in Mac OS X 10.3 (Panther). Top o’ the window to ya! Close (red): Click this button to close the window. Minimize (orange): Click this button to minimize the window. Clicking Minimize appears to close the window, but instead of making it disappear, Minimize adds an icon for the window in the Dock. To view the window again, click the Dock icon for the window that you minimized. If the window happens to be a QuickTime movie, the movie continues to play, albeit at postage stamp size, in its icon in the Dock. Expand (green): Click this button to make the window larger or smaller, depending on its current size. If you’re looking at a standard size window, clicking Zoom usually makes it bigger. Click Expand again to return the window to its original size. Yet another way to see more of what’s in a window or pane is to scroll through it. Scroll bars appear at the bottom and right sides of any window or pane that contains more stuff — icons, text, pixels, or whatever — than you can see in the window. 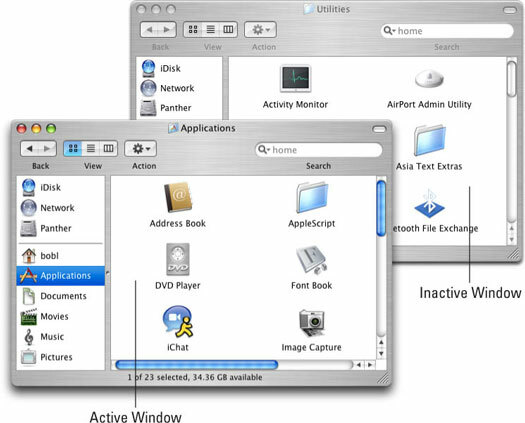 As shown in Figure 2, dragging the scroll bar on the right side of the right pane reveals the items above DVD Player and below System Preferences, depending on whether you scroll up or down. And dragging the scroll bar on the bottom of the window reveals the Date Modified column, which is located to the right of the Kind column. Simply click and drag a scroll bar to move it either up or down or side to side. 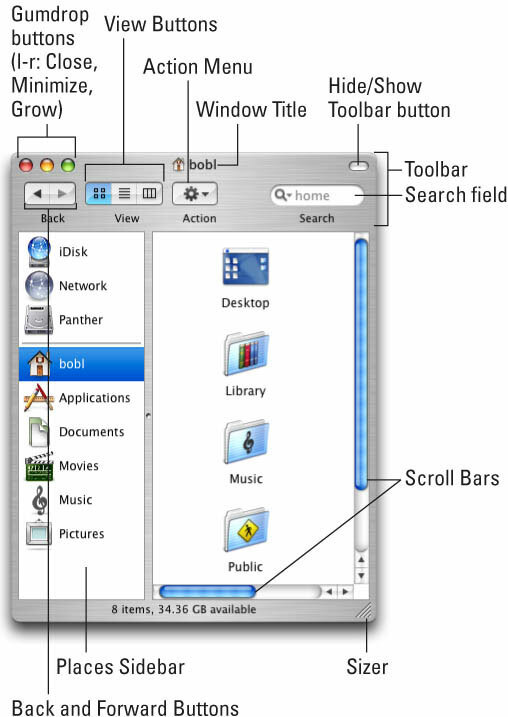 Figure 2: Use scroll bars to navigate a window. To work within a window, the window must be active. The active window is always the frontmost window, and inactive windows always appear behind the active window. Only one window can be active at a time. To make a window active, click it anywhere — in the middle, on the title bar, or on a scroll bar — it doesn’t matter where, with one proviso: You can’t click the red, orange, or green gumdrop buttons of an inactive window to activate it. When you hover your mouse pointer over the red, orange, or green gumdrop buttons of an inactive window but don’t click your mouse button, the gumdrops light up, thus enabling you to close, minimize, or expand an inactive window without first making it active. Look at Figure 3 for an example of an active window (the Applications window) in front of an inactive window (the Utilities window). Figure 3: An active window in front of an inactive window. The active window’s title bar Close, Minimize, and Zoom buttons — the red, orange, and green ones — are, well, red, orange, and green. The inactive windows’ buttons are not. This is a nice visual cue — colored items are active and gray ones are inactive. Better still, If you move your mouse over an inactive window’s gumdrop buttons, they light up in their usual colors so you can close, minimize, or expand an inactive window without first making it active. Neat! Other buttons and scroll bars in an active window look different, too — they’re bright. In an inactive window, these features are grayed out and more subdued. The title bars of inactive document windows are also translucent, thus allowing what is behind them to partially show through. The names on inactive windows are dimmed. Active windows have bigger and darker drop shadows than inactive windows.